Shop Dogeared, at Dogeared.com, for whimsical and sentimental jewelry that makes great gifts. Dogeared offers necklaces, bracelets, earrings, bags, and even ornaments. Send your best friend a Dogeared Make a Wish necklace, something from the Eat Pray Love collection, or Karma earrings. 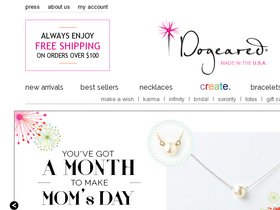 Shop pearls, charms, bridal jewelry, and beads at Dogeared. Be sure to see RetailSteal.com for the best Dogeared coupons, Dogeared promotions, and Dogeared discounts. Dogeared ships via UPS and USPS. Allow 7 days for shipment in the US. If you would like a refund, return item within 30 days of purchase date. See website for full details, certain exclusions may apply. Shop at Dogeared.com and enjoy $10 savings on orders $100+. Click here for code. Shop at Dogeared Jewels & Gifts and save $5 on your purchase $50+. Use coupon code. Save 10% with any order using the coupon code at Dogeared Jewels & Gifts. Click to save. Save up to 50% on jewelry at Dogeared.com. Click link now to check out the earrings, bracelets, and necklaces. Shop at Dogeared.com for Pearls of Friendship, now as low as $24. Click here to shop. Find bestsellers starting from $26 at Dogeared.com. Click link to shop.